Green Men are not at all restricted to Rosslyn Chapel. Green Men are to be found in many ecclesiastical buildings all over Europe, the Middle East and Iran. The Green Men at Seaton Collegiate Church are every bit as interesting as those at Rosslyn. The chap above only has foliage coming out of one side of his mouth but there is a reason, as you can see, for that. 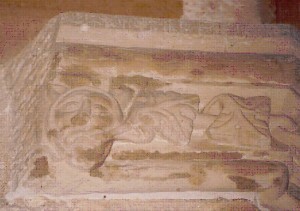 This Green Man is the start of the line, or course, of foliage which was intended to extend round the interior of the church and terminating with another similar Green Man opposite who also has vegetation coming from one side of his mouth. In order that the visitor might be better enabled to ‘see’ this Green Man we have converted the image into a negative, below, a process which can sometimes reveal more details. In this instance the face etc. appear to us to be much clearer.